Wilmington - Louis Paul Davis, 67 of Wilmington, DE passed away on January 13, 2019. Lou was born in Philadelphia, the son of Thelma Merbrier, Louis J. Davis and Stepmother, Kathryn Davis (Moseley). He was a 1969 graduate of Cardinal Dougherty Highschool and attended Temple University. Lou spent most of his life being dedicated to and working hard in sales. Throughout his years Lou worked with the late Joseph Villanelli, the band director for McKean high school as the percussion and drum line instructor. They collectively won the Music Educator’s Award for Excellence. Lou was self taught and had incredible determination. He played both individual and inline snare drums. 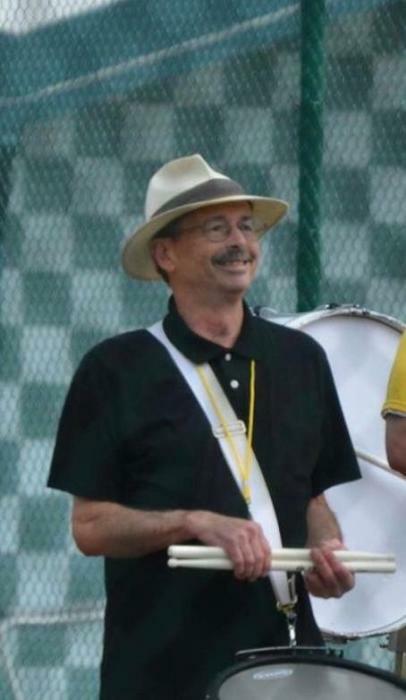 He was known for instructing percussion students, and for his devoted involvement with the Yearsley Blackhawks, Blue Rock & many other Drum Corps “DCI” affiliates. Lou was an integral part of Blue Rock history, not only on the field but also off the field. He was a part of their winning the 1971 National Championship with his drum line. Lou is survived by his wife of 40 years, Bernadette R. (Schmids) Davis; his 3 children and their spouses - Louis M. “Louie” Davis (Jenifer) of Jacksonville, FL, Lauren M. Orga (William) of Wilmington, DE, and Lesley A. Davis (Joseph Stripling) of Wilmington, DE; his 3 wonderful grandchildren - Madilyn, Evan and Jordan; his brother, Stephen Davis (Mona), and sisters Carolyn Dixon (John), Donna Marquart (Joseph) & Kimberly Bubnis (Joseph). Lou was also held in deep regard by his extended Schmids family of in-laws; Joseph Schmids (Eileen), Jeanette Chaklos (Edward), William Schmids (Linda), Charlotte Fitzpatrick (Daniel), John Schmids (Diane), Paulette Fedyk (Stephen), Annette Bradigan (Randall), & Michael Schmids (Hope). Lou will be remembered as a loving husband, brother, "Dad," “Grandpop,” “Uncle Lou” & “Louie.” He was an avid Philadelphia sports fan and enjoyed watching the games with family. Lou’s passion was music and permanently influenced others by introducing many artist’s including the Tower of Power band, which still plays throughout his families households to date. He was a great dancer who could steal the show at any wedding or party. His enjoyment for story telling and incredible sense of humor brought much laughter to all his family and friends. Lou loved a great backyard BBQ, picking MD blue crabs with “extra spice” and spending time at the Shore. Wildwood, NJ, held a special place in his heart. It hosted numerous family vacations and the yearly Blue Rock Drum Corps Reunion. Attending this reunion was a special opportunity for Lou to reconnect with longtime friends and refuel his talents. The Christmas season will always hold a special memory of Lou. He was dedicated to tradition and keeping a beautiful holiday home. Lou is known for his breath taking Christmas Trees and extravagant lighting displays. His attention to detail brought many family and friends over for the holidays. His children will cherish those blessed memories. 1301 S. Rodney St. Wilmington, DE 19805. Please note that there will be a Family Only Service held prior. If you arrive early, please refrain from entering the hall until the doors open at 12:30.